'Zebra Fill 2' includes the latest 3 U-He Zebra 2.7 preset collections from Jeff Rhodes of Perimeter Sound/SoundSpice. You receive SH4RP - COILED - Locksmith : Keys & Leads in Zebra Fill 2. 396 Zebra 2.7 patches & 327 arp patches all total. Get this triple batch of new sounds for your productions. Some of these patches were used in the 'Experimental Dubstep' & 'Ambient Glitch' series from Producer Loops, as well as in 'World Tek', and some recent SoundSpice collections like 'Other Space Industrial', 'Dub Extraction' and some yet unreleased sets. Just like with the original Zebra Fill collection, each set has a slightly different focus, and each set definitely has some new and different programming techniques used. So no matter which one you open first, you are bound to hear something you will want to record. 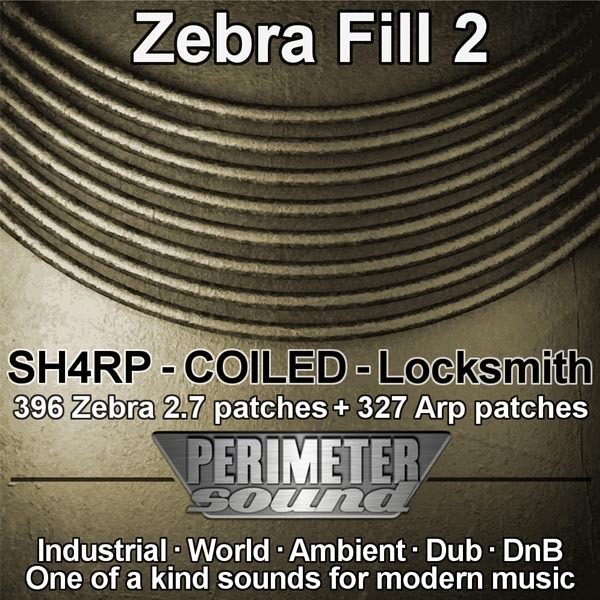 'SH4ARP: Zebra 2.7' from Perimeter Sound Arts features 238 new patches for the Zebra V2.7 VSTi. If you are looking for cutting edge sounds, then you have arrived. No wimpy pads here, no long droning atmospheres, only basses, leads & synths. These crisp new sounds are designed to cut through the mix, literally. The sounds are organized into categories: Basses, Leads & Synths. 'COILED' is a soundset for the U-he Zebra 2.7+ VSTi. Featuring 101 new presets each with an Arp variation. 17 Soundscapes, 17 FX, and 10 Drum/Percussive patches are also included in the set as a bonus. The focus of this set is on the amazing Comb Module of Zebra, with a variety of plucks, bows, and purely synthetic creations. You are bound to discover new moods and be taken in different creative directions. All of the main (101) patches have Modwheel assignments and all 4 X/Y Pads have been set up to change the sound in a multitude of ways both quickly, and easily. 'Locksmith Keys & Leads: Zebra Patches Collection' features 266 presets for the U-he Zebra software synthesizer including keys, leads and bonus bass and synth sounds. Plus arp variations of all patches, along with all 4 X/Y Pads and Modwheel controller assignments. These patches are for use with all styles of music, any time you need some interesting keys or a one of a kind lead sound. Modwheel settings have also been included for adding dynamics when playing live. All patches have custom waveforms too, so that you achieve a more unique sound. Zebra's 'duophonic' mode is featured quite often in this set, it was used to add some wild-yet-subtle life to the lead sounds. While the arps use only simple octave patterns to add to your music. These patches are for use with all styles of music, any time you need some interesting keys or a one of a kind lead sound. Grab the freebee try-before-you-buy pack and try them for yourself today. Design © Siajo and Eclipse Sound. All rights reserved.